Our Thyroid Medications contain various thyroid hormone products (thyroxine) for treating underactive thyroid (hypothyroidism), including synthetic thyroxine and thyroid gland extracts. 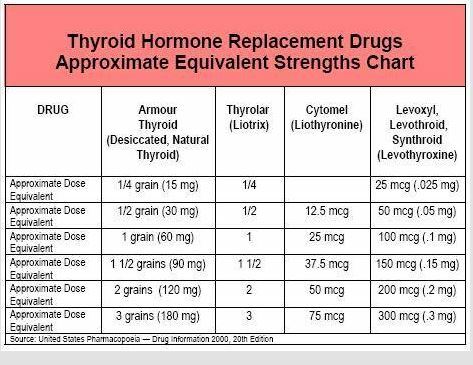 If you are switching thyroid brand there is a conversion chart at the bottom of this page. Please click “read more” at the bottom of this page to see it. Principal brand name products are shown in the left column and generic alternatives are to the right. Use the search feature to quickly find the product you are looking for, by entering either the active ingredient, e.g. Levothyroxine or the product name, e.g. Armour Thyroid. The thyroid gland, which sits just below the Adam’s apple in the neck, is an endocrine gland that produces hormones secreted directly into the blood. The thyroid gland produces two hormones; calcitonin, which regulates calcium metabolism and thyroid hormone, which controls many important body functions, including how the body uses energy, regulates temperature, metabolises nutrients, and controls growth and development. Thyroid hormone synthesis is dependent on iodine and a deficiency of iodine can result in a deficiency of thyroid hormone and a swelling of the thyroid gland known as goitre, in which the thyroid tissue grows to compensate for lack of thyroid hormone. Thyroid hormone exists in two forms. Thyroxine or levothyroxine, also known as T4 and liothyronine or L-triiodothyronine also known as T3. Up to 90% of thyroid hormone secreted by the thyroid gland is T4, which is inactive but is converted to the active form of thyroid hormone T3 when it reaches its target tissue. This conversion takes place in the liver, kidney and other tissues of the body and T3 then interacts with a specific receptor inside the nucleus of cells, to influence the transcription of specific pieces of DNA (genes) to produce proteins needed to manage and control a variety of processes, including carbohydrate, fat, protein and vitamin metabolism. The production of thyroid hormone is regulated by a hormone produced by the pituitary gland in hypothalamus, which is an area at the base of the brain and is called thyroid stimulating hormone (TSH). When levels of thyroid hormone in the blood are low, this stimulates increased production of TSH and thereby increases production of more thyroid hormone. Conversely, when thyroid hormone levels increase, TSH production is decreased. This is known as a negative feedback loop, which helps maintain normal levels of thyroid hormone in the blood. Underactive thyroid, known as hypothyroidism is caused by a lack of thyroid hormone. The most common cause for this is the development of autoantibodies against the thyroid hormone producing cells of the thyroid, a condition known as Hashimoto’s disease. Another common cause is a deficiency in iodine. Other causes include, viral infection, cancer radiotherapy and it can occur temporarily in women after giving birth (postpartum thyroiditis). Symptoms of hypothyroidism include: tiredness, muscle weakness, cramps, feeling cold, a slow heart rate, dry and flaky skin, hair loss, a deep husky voice, weight gain, constipation, depression, joint or muscle pain, menstrual disturbances. Treatment of hypothyroidism involves hormone replacement for the lack of thyroid hormone. Several sources of thyroid hormone supplement are available, including synthetic thyroxine and thyroid gland extracts. Levothyroxine,a synthetic form of naturally occuring T4 that is more stable but less active than T3 and is carried in the blood to the target tissues where it is converted to T3. Liothyronine, a synthetic form of naturally occurring T3 that is less stable than T4 but is up to four times more active and acts rapidly. These hormone supplements need to be taken continually and often for long periods to replace thyroid hormone deficiency that may be lifelong. Overactive thyroid, also known as hyperthyroidism, is caused by high levels of thyroid hormone or thyrotoxicosis. The most common form of hyperthyroidism is Grave’s Disease or goitre, which is thought to be an autoimmune disease where autoantibodies called thyroid stimulating immunoglobulins bind to the receptor for Thyroid Stimulating Hormone (TSH). This causes over production of thyroid hormone due to loss of regulation of thyroid hormone production. Hyperthyroidism can also be caused by inflammation, a tumour or a virus infection. Symptoms of hyperthyroidism are due to increased production of thyroid hormone, which causes increased rate of metabolism. They include nervousness, restlessness, irritability difficulty concentrating, tiredness, rapid heartbeat, heat intolerance, increased perspiration, difficulty sleeping, hand tremors, weight loss, increased appetite, frequent bowel movements, and muscular weakness. Treatment for hyperthyroidism involves blocking the production of thyroid hormone to restore normal hormone levels. Carbimazole is an anti-thyroid drug that inhibits the action of thyroid peroxidase, an enzyme that is involved in the coupling and iodination of thyroglobulin, which is important for the synthesis of thyroid hormone and when its action is blocked, synthesis of thyroid hormone is also blocked.